It must take some nerve to broadcast your run-in with the local tax authorities to the world at large. And it must take balls of steel, or immense bravado, or both, to publicly assault a government which can remove your license to operate at more or less a moment’s notice. 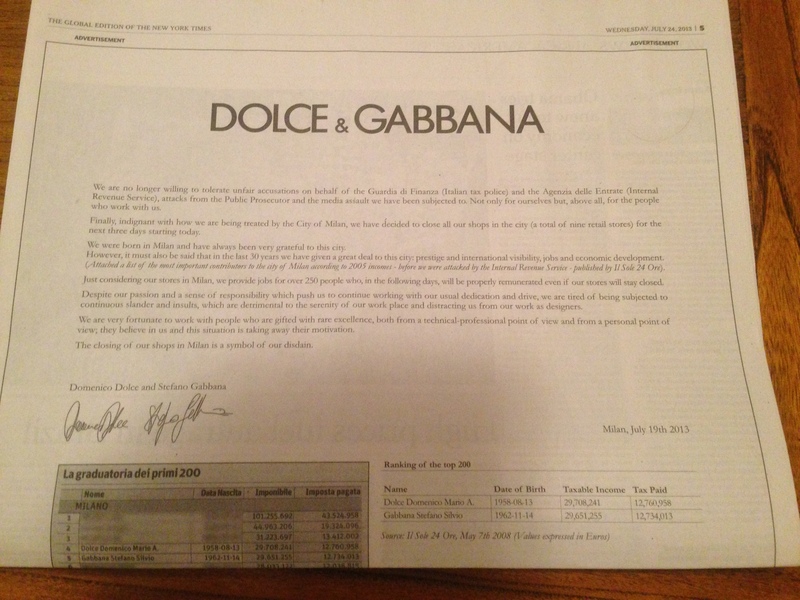 There again, Messrs Dolce & Gabbana are no shrinking violets. So perhaps it should have come as no surprise to have come across a full-age advert (see below) in the IHT during a flight last week from Singapore to Hong Kong in which the Italian tax authorities chasing the two designers for alleged tax evasion are accused of ‘slander and insults’. The ad also ran in two Italian newspapers. The duo also shuttered shops in Milan, mounting signs in the windows saying ‘Closed for indignation’. With the imminent prospect of jail sentences and a fine running into hundreds of millions of euros, perhaps they felt they had little to lose. From a communications perspective, the two have misplayed their cards. The move prompted the local Milanese government to ban the company using public space in the city and can only have further prickled the national tax authorities and government. They have also managed to broadcast their woes to a broader public which may have had little or no prior knowledge of their apparent indiscretions (myself included). Presumably, the idea was to galvanise public support. But they appear to have misjudged the public’s tolerance for tax evasion, and while their customers may or may not care one way or the other, many others will now view them in a less than rosy light, not least after other recent mishaps such as alienating Hong Kongers. Time will tell to what extent this impacts the business they are now threatening to close. That the reputation of the two, and of their company, is fraying at the seams does not bode well.